The 17 track collection album includes some of Tyler’s most requested songs, performed by the most beloved voices in LDS and Christian music. The album also includes brand-new songs, performed by Tyler, as well as newly recorded versions of popular, previously released songs. 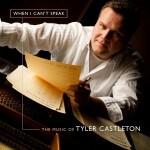 The songs on the album, which released May 14th, were hand selected by Castleton. Each of them has special meaning to him and illustrates his reason for writing. He describes the album as a “celebration of songs,” because it represents the work of so many people.